Individual creme brulee dishes by Apilco from William Sonoma. When shopping for this dish, you want to try and choose vegetables that are the same size. This is delicious the same day or the next day, slightly warmed. 4 or 5 shallots, depending on size and cut into small dice. 4 roma tomatoes, any small tomatoes are fine, roma or plum work well due to their size and shape. 6 or 7 fresh springs of thyme. Remove the leaves from all but four sprigs and chop fine. Reserve 4 sprigs for top of gratins. Drizzle olive oil in each of the 5- inch individual gratins and place on a baking sheet. In a medium sauté pan, heat the olive oil and add the shallots and cook for 8 to 10 minutes or until they are soft. Add the garlic and stir with the shallots for a minute, then remove from heat and spread the shallot and onion mixture on the bottom of each dish dividing evenly. 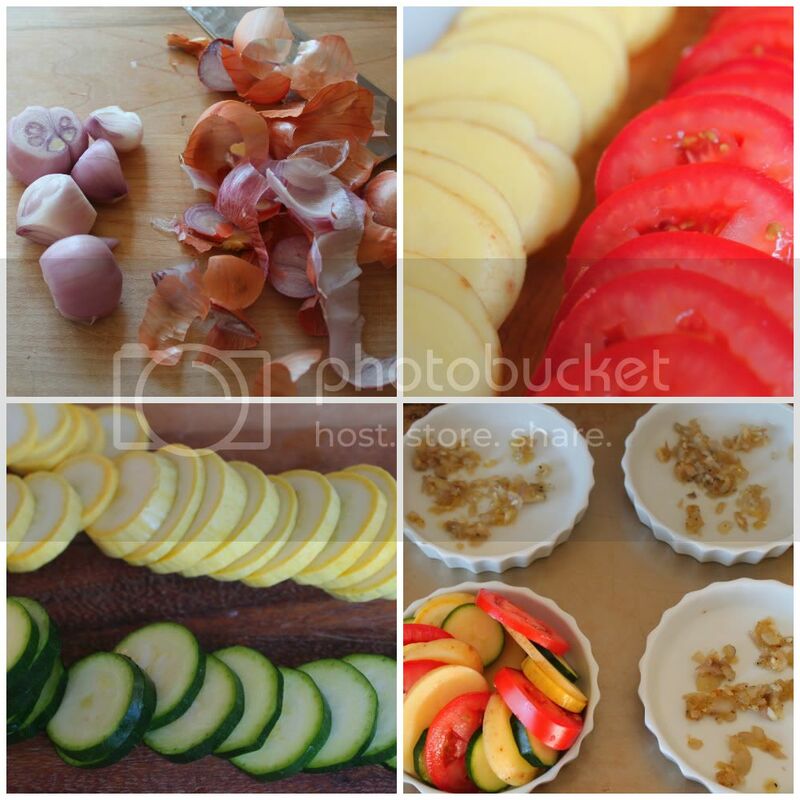 Slice the potatoes, yellow squash, zucchini and tomatoes about ¼ inch in thickness. Arrange in a circular pattern alternating the vegetables in each dish creating one layer. Drizzle with olive oil over each dish and sprinkle each with the fresh thyme, salt and pepper. Cover with foil and bake for 35 minutes. Remove foil and place 5or 6 shards of Parmesan cheese shaved with a vegetable peeler. Add one sprig of fresh thyme and put back in oven and bake just until cheese melts. That looks good, and pretty easy. I'll have to try it. Oh Annie these are so pretty and the colours look delectable, I am sure they are as delicious as they look. If ours, should we ever produce them, look even half as delicious, and tempting, as these, then we do assure you we shall eat up all our vegetables - and probably not even want or have room for pudding! Gorgeous! I have to go get some of those little dishes, I have a Crate and Barrell outlet nearby---hope I can find them. That looks incredible and so pretty! I may just use this recipe for an upcoming dinner party! You really take the best photos and I really need to take a class to learn how to use my camera better! The dish looks amazing. Always love new ways to make veggies! This is going on the menu this weekend...delicious, no doubt, and beautiful too!! no, seriously I am now desperate to eat this!!! !